Saturday 08:30 – 17:00 and Sunday 07:30 – 17:00. Admission to the Cathedral is free. Group visits: by appointment, charges apply. For more information on the new Library, please click here. Rochester Cathedral is located in the heart of Rochester's busy high street and a five minute walk from Rochester train station. From the M20, exit at junction 6 and take the A229 to Rochester. From the A2, take the "Rochester" exit just before the M2 starts. There is no Cathedral Car Park, but there is plenty of council car parking available. There is no postcode for the Cathedral. The west doors face Boley Hill. There is access for wheelchairs through the North door into the Nave. 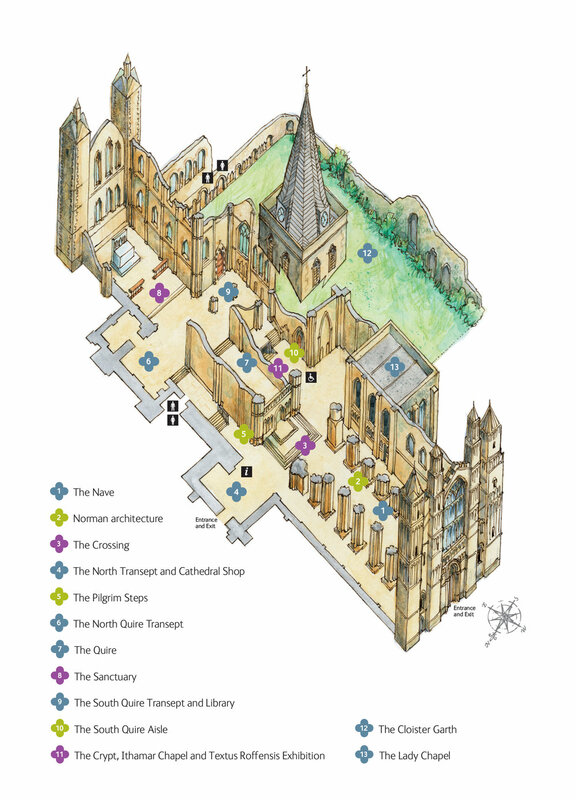 There are WCs for people with disabilities in the Cathedral (by the South Door). The Welcome Desk is situated in the North Transept of the Cathedral and open mostly between Monday to Saturday 10:00 – 16:00, Sunday 12:00 – 16:00, except for occasions when the Cathedral is being used for events or services. Photography is allowed for personal use only. Photography for publication requires permission. Please contact the Cathedral for further details. Photography, video or mobile phone recording is not allowed during services or rehearsals for services and concerts. We ask that visitors respect this sacred space and turn off their mobile phones during such times. Gundulf’s Norman priory was built on the south side of the current Cathedral to maximise light and warmth from the sun. It comprised of a group of buildings arranged around a square garden (garth) with a covered walkway (cloister) along each side. The monastery was closed in 1540; a few ruins around a square garden are all that remain. Although the monks are long gone the Garth is still a place to inspire peace and reflection, a place to ponder on the beauty of nature and the wonder of God’s creation. Deep borders are planted with a collection of roses providing a showcase of the history of this glorious flower. The rose is an ancient metaphor for Mary, the Mother of God, and also links to a former Dean of Rochester, Samuel Reynolds Hole, who co-founded the National Rose Society in 1858. A memorial to him can be found just outside the eastern end of the Lady Chapel.